Irene Ródenas is a product designer and artist born and based in Barcelona (ES). Graduated in Product Design from Elisava School of Design and Engineering of Barcelona (2015), she is currently finishing her MA Interface Cultures at Kunstuniversität Linz (AT) focusing on educational interfaces in the context of the digital era and our relationship with machines. 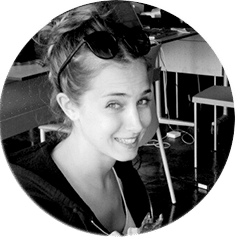 During her BA studies, she started to work with new technologies and interactive installations in order to experiment with different fields and learn the basics of interaction. She has participated in the international art festival Ars Electronica, as part of the U19 group and the Campus Exhibition of Interface Cultures. Currently, she is exploring the potential of the processes and its understanding of a positive society. Experimenting with and from different perspectives, the focus point relies on the way (process) and not just on the final goal. This leads to an ongoing research on collaborative tangible nets and the connections, thoughts, educational methods, and different types of communication between people and machines.